Learning in close proximity isn’t easy. Students sit side by side, face each other. The possibility of eye contact is inevitable. Any student who is the least bit social or curious will likely engage another. Tempers and passions can flare unexpectedly. Lines are drawn, dividing your side from mine. The annoying tap, tap of a pen or unconscious jiggling of a leg can drive a sensitive, distractible student to shout, “Stooppp!! !” when it becomes too much. Asking a room full of 30, 11-year olds not to pay attention to their neighbor is ridiculous. There are moments when all are deep into a book or a piece of writing. And there are a few students who have the ability to remove themselves mentally no matter what. For these few, being distracted from their books takes a lot. But for the majority, distraction is the norm. I don’t blame them. I’d want a separate place. 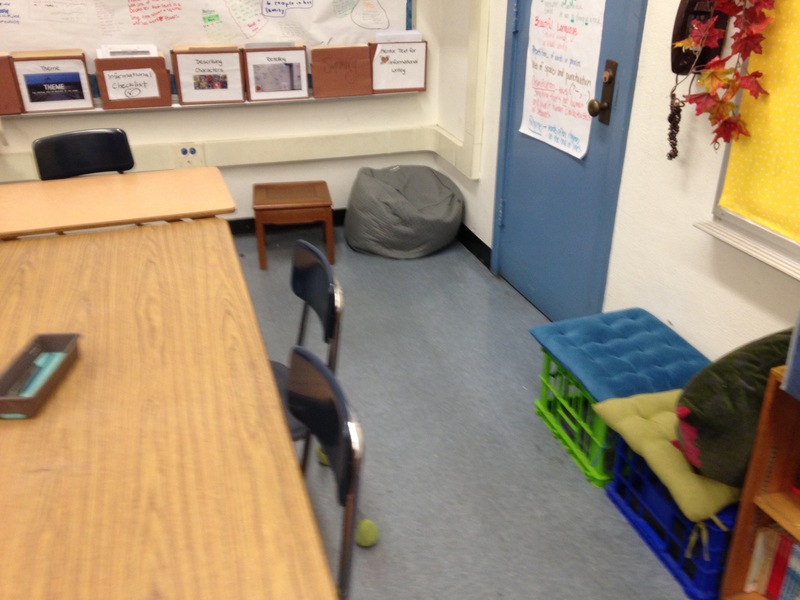 So I try to create spots for students that give them breathing room and space. To spread out. 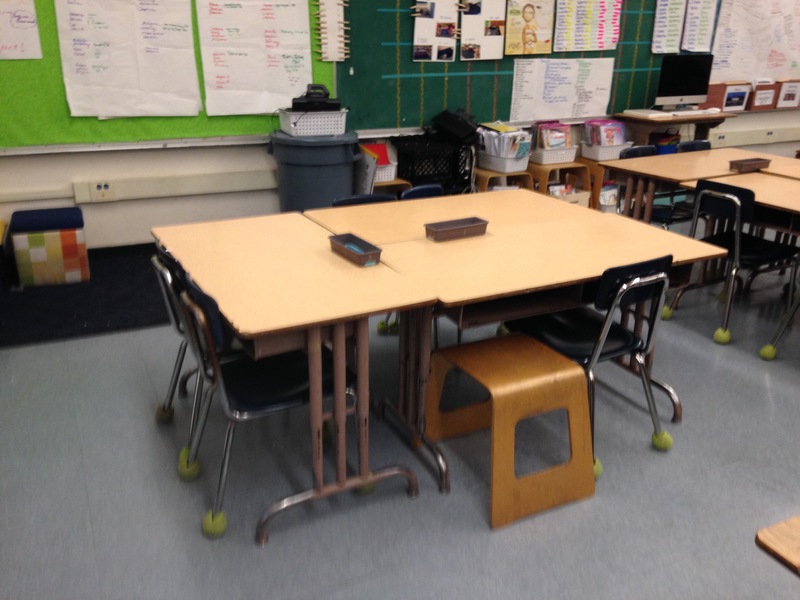 Last week, my conferring table, piled with clipboards, and other tools became a new desk. I travel around anyway. The desk was just a place to store and stack. The resulting change has made for a better work environment for students and a more efficient me. I thought I had it, but students saw the changes and asked for more. Tonight I looked at my classroom and could not see any possibilities. I have no desk; I can’t eliminate the doc cam table. Frustrated, I started to move tables. No. No. and Nope. 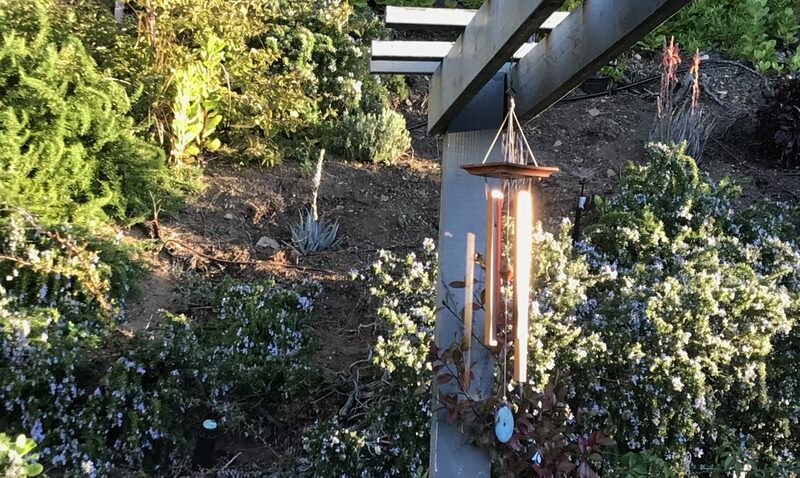 Finally, an adjustment created a new spot. Another place to go to when a neighbor is too close for comfort and all other classroom options are taken. We’ll see. Tomorrow we’ll test it out. 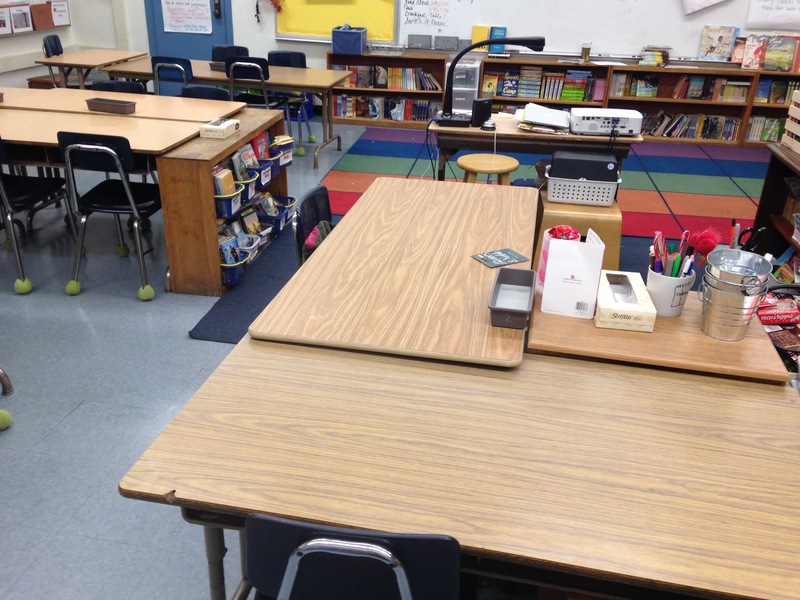 i hear your frustration – i have tables so there is really a lot less room to move around! Do you have any pictures? I’ll take some tomorrow and add it. I’m hoping to hear how other creative teachers and students deal with this issue. 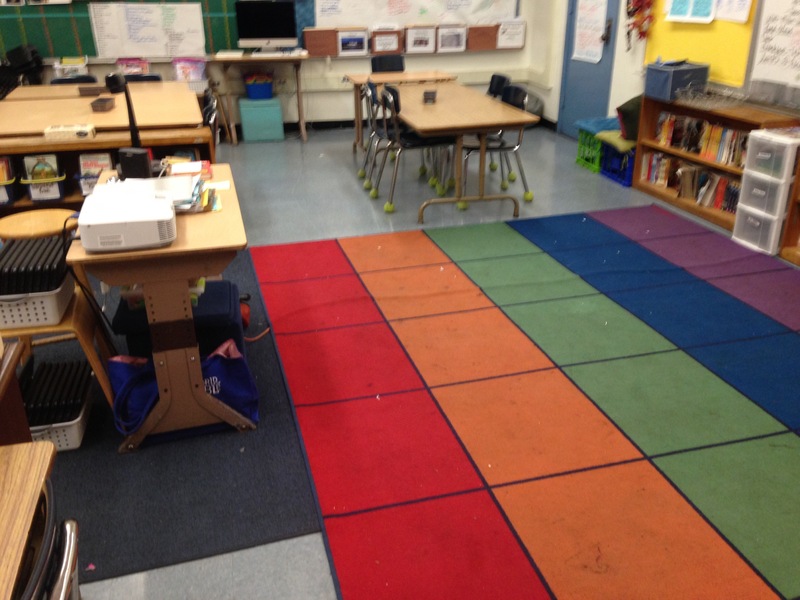 The carpet can provide options, but sometimes kids need desk space. I’ve never seen a classroom yet that is big enough, and I daresay 30 adults could not survive day after day in the space allotted to 30 children… another sign that some priorities are not what they should be… just saying. 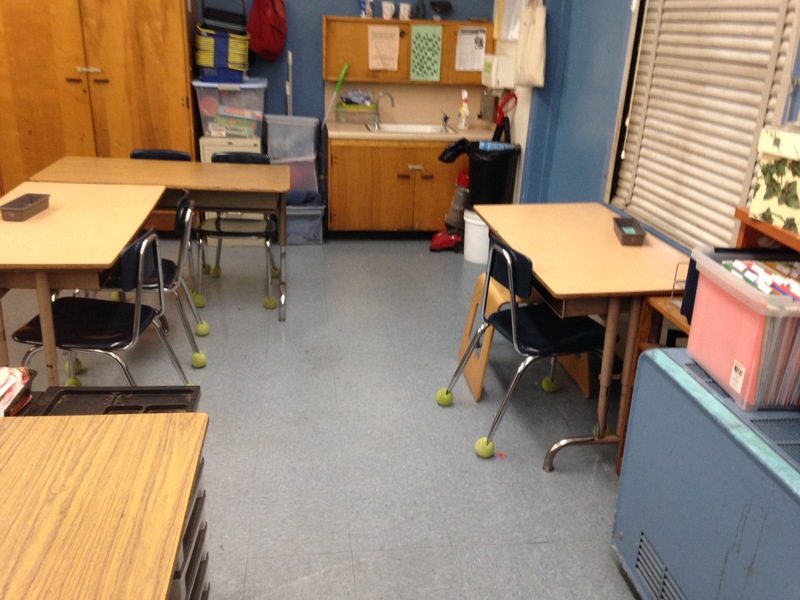 I am always in awe of what teachers can do with a little space. Finding space and organizing it is not a strength of mine! Hope your changes work well. Post pics! I’d love to see it! 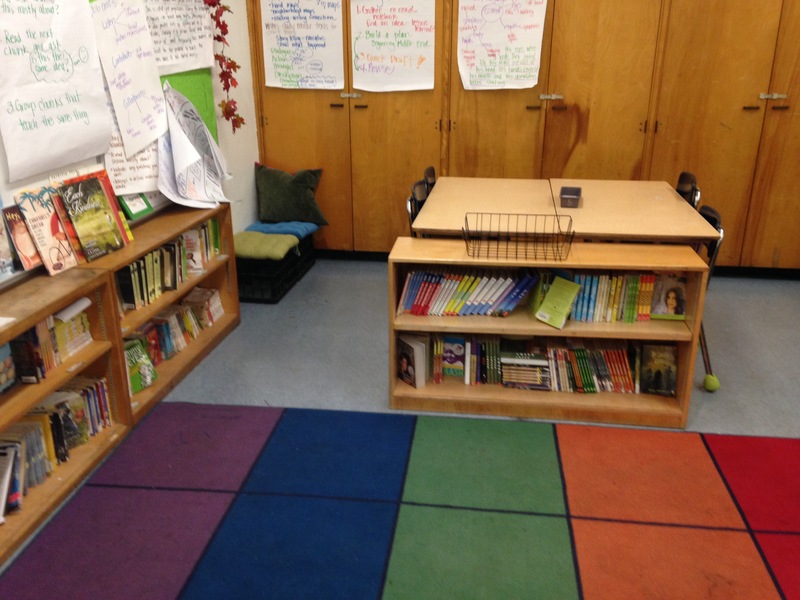 Redesigning your classroom to create new cubby holes is always a practice in diligence. Creative spaces for all learners is a must so I applaud your determination to accommodate all of your students, Julieanne. Have a great day. I tried to go without the desk for me a few times. I tried, really I did. But I needed a little place to nest and think. So I went back to embracing the teacher’s desk with a bookshelf anchoring my spot. I do make sure there are lots of places to go for students who need to have some alone time. I have students sitting in groups. But I also encourage them to pull away when they need less visual stimulus. Most of my individual spots are facing walls. I hope you are able to make some spots you are happy with. It is hard to get a classroom to function in a just-right way when there are so many kids (with personalities, learning styles, etc.) with different needs. Scratch that. It’s beyond hard. It’s a constant challenge. I feel for you! It is frustrating. I assume you don’t have a “living space” with a sofa & chairs, etc. That was one thing that helped in my classroom. Students were free to work wherever they found a place. Some went to the library. Good luck with those spaces. Ah… wouldn’t a living space be lovely! I have a large rug and pillows that work for some, sometimes. It’s a juggling act. Wow! Thirty eleven-year-olds in one classroom is just crazy!!!! Maybe you could brainstorm with them for suggestions with how to cope. You are such a caring teacher to devote so much time and energy to making enough space for them. “Back in the day” (the 50’s) we were expected to each sit at our own desk. And shut up!! There was no such thing as “spaces” for kids. We’ve come a long way….or have we? Most amusing (and distressing) are the parent notes! I don’t have a desk, either, and there never seems to be enough space for my sixth graders who just grow so BIG in the space of a school year! Creating space for your kiddos is such a gift to them, Julieanne. Too many kids and too little space, that’s an issue difficult to solve. I was amazed by the space that you could create the day I visited you (so long ago). Good luck! I feel your frustration. I’ve been there too many times to count. Sometimes, all it takes is shifting furniture around to give more options. Good luck and let us know how it goes. I’m glad u posted pictures. How did it end up going ? !